Pasadena, CA, April 11, 2019 --(PR.com)-- Kevin J. Moore, of Kevin J. Moore & Associates Law Firm, was named 2019 Top Attorney in Pasadena Magazine. The Pasadena Magazine 2019 Top Attorney’s List is based on an online peer review survey sent out to practicing attorneys in the Pasadena area. 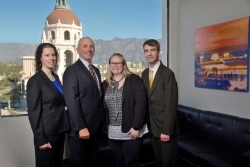 “To be recognized by peers as one of the leading estate planning attorneys in Pasadena is a tremendous honor,” said Mr. Moore. The Law Firm of Kevin J. Moore & Associates has over 25 years of experience in estate planning, trusts, probate, real estate, corporate law, tax planning, international tax, and tax avoidance, helping individuals and businesses protect their wealth and assets. The firm also has extensive experience in probate litigation, such as will contests, and representing trustees and beneficiaries. Likewise, Mr. Moore represents clients throughout southern California in cases relating to improper valuations of real property. Recently, an appeal won by Kevin J. Moore in a property tax assessment matter was certified for publication and is now precedent in the State of California. Email abrown@kjmlaw.com for all marketing and media related inquiries.